Old men during partition trek between Pakistan and India, 1947. A family during the partition trek between Pakistan and India, 1947. 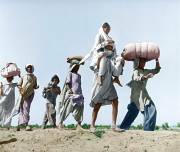 People during the partition trek between Pakistan and India, 1947. 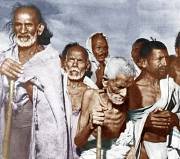 Men with his oxs’ during the partition trek between Pakistan and India, 1947. A young boy with an empty water pot during the partition trek between Pakistan and India, 1947. An old man during partition trek between Pakistan and India, 1947.